The Shaker sofa is part of the Primal collection designed by Egg Designs and manufactured in South Africa. This contemporary bespoke sofa was inspired by the abundance of weaving in South Africa, we asked ourselves how we could use it as a technique to create a modern sofa that when view still has a strong African identity but in modern and unique way. The base is a combination of hand turned solid walnut uprights and a walnut veneer base, the turned "needles" are then woven with a black synthetic rope to create the beautiful back mesh. 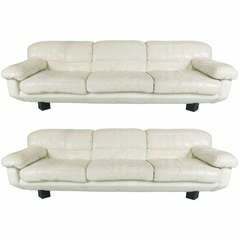 This sofa deserves a central position in a room as the back is best viewed 3 dimensionally. The puffy comfortable back and seat cushions are upholstered in leather, the back cushion have a timber toggle attached to fix them to the woven rope. 1980s Italian leather sofa raised on black enameled triangular feet in its original distressed white leather from the "Collezione Poltrone" by Marco Zani. Pair available. 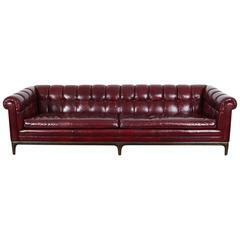 The "Confidential" series sectional sofa in original leather. Designed by Alberto Rosselli for Saporiti.